OK, some guys are gear heads, and some guys aren’t. Everyone has their weakness. Somewhere along the way I became a Simms freak. I’ve always had a weakness for top shelf workmanship, materials and functional styling no matter whose name is on it. A Simms shirt here and there, and pretty soon there are a few Simms shirts hanging in the closet. Simms waders? Well, I have had my issues with my Simms waders, and wonder who will be selling me my next pair of waders. Gloves and socks, sure. 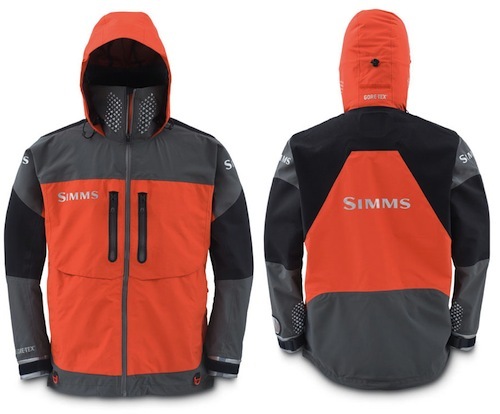 I was looking to get a few things for this winter, and heard from my supplier that Simms was out of stock on the things I was looking at, making me wonder if there was a supply problem, or new styles were about to roll out. The latter is true, and as usual, you can count on Simms to come out with a new fabric to base some already proven designs upon – that would be airbag fabric. Now, if you had ever seen an airbag detonated, which I have witnessed, you would have a ample appreciation for the material used to make airbags. I know I do. After all, an airbag is propelled by solid rocket fuel. 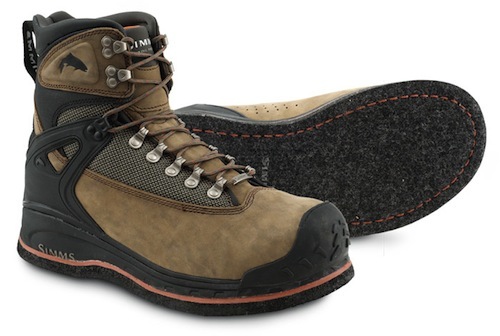 Retrograde to Simms felt, and quit slip sliding away? Coming soon to your local pro basser. There’s a lot more to see … like the Pro Dry line of products, designed for the bass pros. I heard rumors at the IFTD show that they would include a bass graphic on them, but for now they simply lack the trademark arched trout (for good reason). If there’s a bass, I can’t see it. Headwaters Half-Day made from Airbag Material. The real excitement does come in the area of the Simms packs and the new 315 HT 100-percent Nylon Auto Airbag Material. You know I have to get my hands on this stuff, and put it through the paces – Texas flats style, all day long and all summer long. 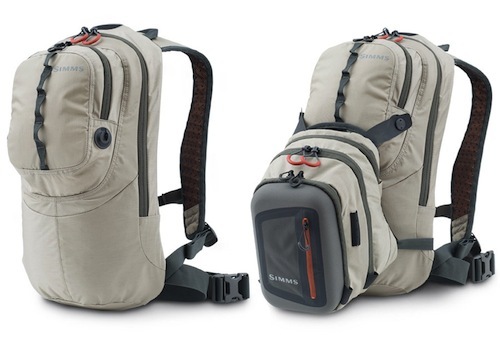 The new Half-day pack already has my name on it. The light color and smaller size look perfect in the two dimensional world. I do wonder why they left out the CamelBak style water carrying capability though. Simms continues to answer the challenge from Orvis’ highly successful Pack and Travel Sonic Seam Waders ($249.) weighing in at just under two-and-a-half pounds, with the updated Simms Blackfoot Waders at an amazing $179.95. If you are looking for an entry point pair of waders, either of these would be a great start. Orvis has the distinct advantage, in this case, of having more size variations to choose from with the Pack and Travels. There’s nothing quite like a Christmas surprise, and this year if you’ve been nice, it’s about time to treat yourself to the quality of Simms. If you ever have any problem with their products, they will take care of you, and once you see their attention to details, I think you will be hooked on Simms products for some time to come. If Santa is reading, take a look at the Half-Day Pack and if I’ve been really good, maybe take a look at the Freestone wading pants. Word on the street is the big boxes have scarfed the new stuff up, and get priority. If you are using “different channels” it could take awhile. Now I’m getting ANTSY! Visited all the local fly retailers (except Backwoods) this week, and post Thanksgiving results are very good as far as sales. Same for the Fly Shop here as well. Check out the closeouts on the old Simms gear by hitting the Simms site at http://www.simmsfishing.com/site/xdpy/sg/Discontinued%20Stock Time to pull the trigger on this perfectly good merchandise?